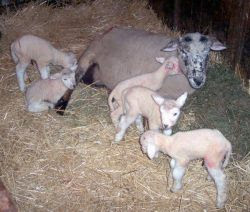 Sunday, at Ragna's visitation, Betsy told me that one of her ewes (named Anna) had quintuplets. I've heard of triplets from time to time, but quints? She sent me a photo of the happy family. Betsy and her twin sister Sarah raise quite a flock. I think they said they had around 40 expectant ewes this spring. This week has flown past so quickly. Tuesday was service prep, worship and Bible study at Mt. Olive. Wed. was wed school, worship, and Bible study at Oak Park. Today I took care of some paperwork regarding the new photocopier, took care of some other business stuff in TR. Visited some shut-ins. By the way, Cora's memory is getting worse. She's been in the nursing home since her brother Ernest had to go to the hospital a month and a half ago. Ernest is home, but Cora needs more care. Please keep her in your prayers. After TR Mary and I went to Oklee for our first parent-teacher conference. On the way to Oklee I heard a news report that Pr. Stafford was in a car accident last night. The ambulance crew treated him and he went home. I'll try to call him tomorrow to see how things are going. It sounded like he was coming home from Bemidji and a pickup with a trailer pulled out infront of him at Sollway. His car was totaled. Only minor injuries to him and the people in the truck-according to the report. It was good to meet the teachers and work together with them in helping Jeremy become a better student. Then, I left Mary with a couple more teacher visits. I had to zip up to Grygla for church, a catechization, and Bible study at St. Petri. Jeremy's got a fever tonight. I hope he feels better in the morning. Just one more photo of Ragna. She's on the left. This was when she was 16 or so. They had used this picture in the newspaper for the paper's weekly guessing game "Who's Dat?" Again, the photo was only 1 inch wide, so it's a bit fuzzy through my camera. The funeral was packed. I think we had close to 300 people at the funeral. It was a nice day, just a little scattering of light rain at the committal. Please keep Ragna's family in your prayers. Well, it was a pretty much normal Sunday morning, Church at St. Petri-Grygla (32m north) at 8am, Oak Park at 9:45; Nazareth (6m east) at 11am. The afternoon and evening were a bit full. 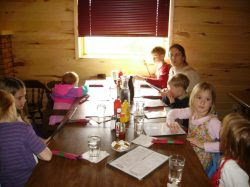 First, no time to cook and stuff so we went to Third Base, a restaurant in Brooks. Then off to Thief River for the next event. Today we celebrated Mable's 85th Birthday. Her sister Laura is on the left, her brother-in-law, Elmer is next, then Mable in the middle. She's still in the Nursing Home in TR and is doing very well. We had to pick up some groceries for the funeral tomorrow. Then I was off to the visitation. Here's a nice photo of Ragna. The original was only an inch wide, so I think my camera did pretty well to capture this much. 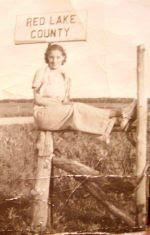 I think she was 14 years old or so in this photograph. The visitation was huge. Many people came and went before the devotion and it was standing room only at the devotion. Now to go and memorize for tomorrow's service. I felt pretty slothful this morning. I'm glad my son, Jeremy, is such a great person. Church was at 9am in Trail-only about 18 miles away. No biggie for a drive. I got up fairly early, made some tea, sat down to read and fell asleep. At 8:00 Jeremy says, "Um, Dad? It's 8:00." Whoah! I got to Mt. Olive plenty early (thanks, Jeremy). Really good attendance today. I think it was around 20 people. After celebrating the Annunciation, we held Saturday School, finishing off the study of the Lord's Prayer. Next week, Baptism. After Sat. School I held pre-marital counselling for a couple that hopes to get married at the end of June. In the afternoon I worked on sermons for Ragna's visitation and funeral; got labels ready for the rest of the Newsletters. That's something I should ask for a volunteer for. The last address update to my database was before the Centennials last June. We're a family with no TV. I can't have it because I'm a TV addict. It doesn't matter what's on, all I need is the stimulus and the 60Hz flicker. So, as a consequence, our whole family finds entertainment in a wide variety of things. We do have movies on the computer once in a while. Where the average TV time for an individual per week is 29 hours, our movie viewing time is probably around 2-4 hours per week. What this means is that we notice what's going on out our windows. Especially when they are red flashing lights. Everyone beware: The Troopers are on to you. He was cruising the road past Oak Park for a good while this evening. I saw him pull over 2 different vehicles. This is different than his previous pattern. If it concerns you it's time to get the newspaper out and make a new daily movement map for the MNSHP. Not that I'd endorse such behavior, no, of course not... um.. Anyway "55 Stay Alive!" See some of you in Church tomorrow. Mary, please remind me to get more paper. This morning Alyssa came to do the bulletin and scheduling. I got the calendar printed up with the April Newsletter. We also worked on singing a Psalm for Wed. Lenten service. We'll see if we can do it. Did I say that I like this new photocopier already? Here I am, such an oxymoron, emphasis on the moron. I yearn for agrarian society, but I drool over technology. Pretty much the whole day was taken with sermon prep for the weekend, Ragna's visitation, and funeral. After supper we watched "Over the Hedge." It was short, and it was funny. I particularly liked the way William Shatner's character made fun of his stereotypical over-acting. There were so many cultural references in this movie, it's worth watching again just to catch more of them. And now, I'm memorizing for tomorrow, celebration Annunciation Day this weekend, 9 months before Christmas. The peace of God be with you all. Erik from the funeral home called me this morning and then Sheryl called. Ragna passed away this morning. Please keep her family in your prayers. Janyce B's mother's funeral is today as well. Please keep her family in your prayers also. Visitation is at Oklee on Sunday from 5-8 with devotion at 7pm. The funeral is Monday at 2pm at Oak Park with committal at Clearwater cemetery. We got the family off for piano lessons and me off to Thief River Falls for funeral planning. I made a few shut-in calls, grabbed some jerkey and a pop and went to Grygla for Lent at St. Petri. Bible study afterward was great. Lots of good discussion. Phone calls Wed School Lent at Naz. Today was full of phone calls in the morning. Followed by prep for Wed. School. I went throught the entire Catechism with the confirmands 3 times. Actually, I had them recite it 3 times. It's not so bad, really, for those of you who think that memorization is tough. I bet you can remember som Alan Jackson songs or lyrics from songs that were popular when you were in High School. Probably you can remember more words from those songs than are in the entire Catechism. And I bet most of you didn't even think you were working hard at it. 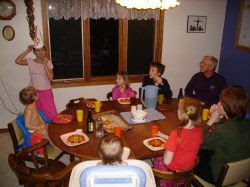 After WS a very hasty supper, then bundle the family off to Nazareth for Lenten services followed by Bible Study. Again, a good crowd with good discussion and questions. Well, we celebrated the faith and the certainty of Gertrude's resurrection today. The funeral was at Oak Park. The Nazareth Ladies' Aid hosted the dinner. Committal was at the Nazareth cemetary. Corella refused to wear her winter coat to the committal. There was a light wind, but it was fairly warm. It was good to see Gertrude's family again. I had hoped to takes some photos of her daughters and their families, but I forgot where I had my camera. In the afternoon I prepared for Lenten services and took off after supper for Mt. Olive. We had worship and Bible Study. Good questions and discussion. Lisa turns 40 today. I wish I had a photo of her handy to put here. I can't count the number of times I've called her for help, advice and a shoulder to lean on. Lisa was a room-mate of my wife back in college. I met her the same time I met Mary, they were almost inseparable. I have a sense of imagination and humor that runs three tangents wide, and Lisa is able to follow my tangents without blinking an eye. She's an excellent theologian who can distinguish between Law and Gospel who works as a counselor in Wisconsin. Many happy returns, Lisa. And may God bless you, Michael, and your beautiful children. Well, today was a fairly long day-but beneficial and fruitful. We had Winkel (pastors' meeting) here at Oak Park. Shirley came in and served us a wonderful roast-beef dinner. I cannot thank you enough, Shirley. It was wonderful. Please extend our thanks to the others involved. But you prepared our plates, and you washed the dishes. Thank you. As we were finishing up our winkel in the late afternoon the guys from Tony Dorn came and installed the new photocopier-Duplexing, sorting, and stapling! Woooohoooo! A quick supper, then to Gertrude's visitation. She was 102+ years old. Actually, from my understanding, she could have been as old as 104. 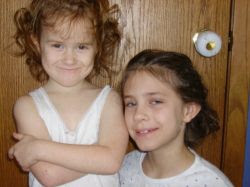 Corrine and Corrella, correct me if I'm wrong. In my discussions with her and her sister, Louella, there was some question as to the year of her birth. She was at least 102. I gave a homily on Ecclesiastes 3, which seemed very appropriate for the number of things Gertrude had experienced in her life. After the visitation I spent some time with Ragna. She wasn't responsive, but I read many chapters and psalms from Scripture to her, prayed with her, and sang hymns to her. Please keep her in your prayers. I got home after 9pm. The funeral for Gertrude is here at Oak Park tomorrow morning. I'm bringing one of the hangers she made for me. It's sentimental, I know. Just remember John 11:35. Our great friend Dave called tonight. Mary got to speak with him after some phone problems. Char, Dave, no matter what you want to give to Jeremy for confirmation, he will appreciate it. He's got enough of his mother in him to know your love for him, and enough of his father in him to be awkward about showing it appropriately. Keep Ragna in your prayers, please. Sunday morning we had church at Nazareth first, then Oak Park and then St. Petri. The reason for this order is that St. Petri had a dinner today. The dinner was nice and well attended. We had a visitor at St. Petri for worship today. I heard today that Janice B's mother passed away. I'll try see her soon. The girls were cleaning their room this afternoon and listening to music. Louisa was teaching Stella to dance to איגי וקסמן and רוני דוני. Late this afternoon Sheryl called to say her mom was doing very poorly. Ragna has had a very difficult time since mid-December. But today they began hospice care. I went up to TR to see Ragna. They're calling the family together. Ragna has been a good friend for these 5 years and it is difficult to see her in this way. She wants to go home to her heavenly Father. I had devotion with her and the family that was there this evening. She was not able to respond. But God's Word of forgiveness works because of His promise, not because of our abilities or lack of them. May God ease her pain and bring her home to Him. St. Patricks day began with Church at Mt. Olive. Pr. Stafford came up to catechize Tyler today. And Tyler did an excellent job. Tyler goes to school at Fosston so he attends Pr. Stafford's release time for Confirmation Classes as well as my Saturday classes-which I had to cancel today because Ray's funeral was at 11am. Pr. Stafford also took care of Ray through the past 3 years so he followed me up to Nazareth for the funeral. The guys at Nazareth were able to get the frozen septic system working again before the funera. Great job guys! The morning was beautiful. God decorated the church yard, the oak trees and the evergreens in the cemetary with beautiful white frost for Ray's burial. 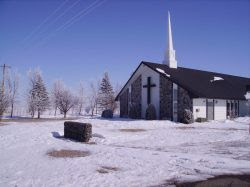 Just before the funeral I got a call to go to a hospitalization in Fosston. So I went there after the funeral. Amanda and Mike have a new baby girl, Emma Amanda Mae, 7lb 8 oz. with a full head of thick dark hair. Amanda is doing well. I spent some time visiting her and her family at the hospital. I got home in the late afternoon, took a nap. After supper I had another home visit that went 'til around 10:30pm. The frost came again this morning, and I was able to get a few photos of it this time. Kyle came over to clear out the parking lot. Alyssa came to do the bulletin. I spent most of the afternoon completing the bulletins and inserts for Ray's funeral tomorrow and part of the batch for Gertrude's funeral next Tuesday. Half way through the batch for Gertrude the photocopier quit. Good thing the new one is coming on Monday. Suppertime I went to TR for Ray's visitation and gave a devotion based on 1 Cor. 15. After the visitation I had a counselling session that went til about 11:30. That's one difficulty for members with daytime jobs: there's no easy way to make a daytime schedule for soul-care with Confession and Absolution. It ends up being odd hours for everybody involved. I could grow nostalgic for the "good old days" of agrarian economy in the area, but then nostalgia is one of the seven deadly sins. So, just deal with it, Joe. The fog was already very thick on the way home. The frost on the trees tonight is as much as 2 inches wide on the lee side. The nursing home called me at around 5:30 or 6:30 this morning (I can't remember when for sure) to let me know that Gertrude had passed away. Please keep her family in your prayers. Later in the morning I went to the office to do planning and writing for Ray's funeral. Tons of phone calls, and something was weird with the phone lines today. We're having a snowstorm right now. Maybe that has something to do with it. 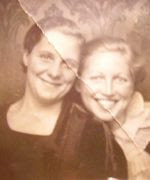 I'll try to get to TR at 4 to meet with Gertrude's daughters for funeral planning. After that I need to get over to Grygla for lent and Bible Study at St. Petri. I hope the roads are plowed. The roads were very slippery. 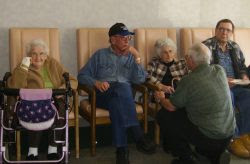 Corine, Corella, and Milt were able to be at the funeral home. I was able to get to St. Petri in time. We had great attendance. Snow don't keep them away. And Bible Study was fun. Got home at about 10pm. Early this morning Edwin called to tell me that Ray died in the night. I'm glad that we were able to be there yesterday with the Gospel in Scripture and in Hymns. I went to TR this morning to check on Gertrude and Ragna. I had devotions with Gertrude. The nursing home help were just getting her out of bed into her chair for dinner. So I spent some time with her, reading from Ps. 23 and John 10 as well as Confession and Absolution, the Lord's Prayer, the Creed, a couple of hymns and the Aaronic Benediction. She was not very responsive, but God's Word works whether it is felt or not. She is very, very weak. I brought her out to her spot in the dining hall and went over to see Ragna. Ragna looked a bit better than when she was in the hospital, but she isn't clear of her trouble yet. So please keep her in your prayers. I met with Edwin and Stella at the Funeral home to do some planning for Ray's funeral. Right now it looks like visitation Friday 5-8 with a devotion at 7pm. Funeral Sat 11am at Nazareth. Tuesday morning we had some work in the house to do. Early afternoon we went down to Fosston to sign our taxes on the way over to McIntosh to see Ray. On the way down there was some nasty noise coming from the front end. So, while we were in Fosston I dropped Mary and the kids off at the Razor's Edge for a couple of hair cuts while I took the van to Craig at the Rosebud Coop. Mary and the kids walked over to the Coop after they were done. Right next to the Coop is this nice old truck. It looks so much like Mater in the movie cars. 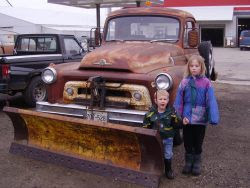 Of course, this one is not a "tow" truck it is a plow. So, it must be a cousin of Mater or something like that. John loved it. Craig got the wheel fixed so that it wasn't wobbling/grinding for us. And we were off to McIntosh. I took Sophie and John in to see Ray. Mary and the other kids went to Niel's Market. Ray was doing very badly. We sang hymns for him and prayed with him. I read several different sections of Scripture to him. He wasn't able to talk, but he did try to pray along and sing with us. He did smile at the kids and looked thankful that they also came. Got home, went to Mt. Olive for lenten service and Bible Study. So, what did we do? We went to a movie. And the movie was about 4 guys going through mid-life crisis and recapturing their aim in life. The movie was Wild Hogs, with Tim Allen, John Travolta, Martin Lawrence, and William Macey. It was ok. The midlife crisis thing was kind of hard to relate to. Well, Martin Lawrence and I are pretty close to the same age. But I don't think I have to go out and discover myself again. We got home and Louisa told me that Edwin had called about Ray. Ray isn't doing well. Later, one of Gertrude's daughters called and told me that Gertrude was doing very poorly. And a bit later, a call that Ragna has been moved to the OP nursing home. I'll do what I can tomorrow. I did a little more trimming of my bow yesterday. Right now I work by floor tillering. On the lower limb you can see a bit of a hinge about half-way down the limb. I'll need to thin out below that and a bit above. The draw weight still seems pretty high. 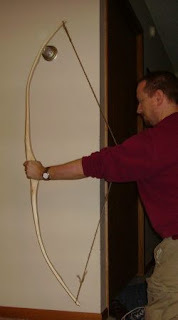 But I'm able to bend it to the extent that the bow could be braced / strung without damage. I got out my home made bow string and finished it to what measured out as the correct length. I don't know how much streatch jute fibers have. 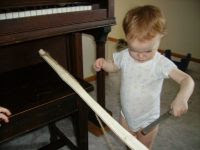 I suppose that also depends upon how tightly I twisted the string. After stringing the bow the string did streatch a couple of inches. However, the string showed no signs that it was breaking. Notice that I put the serving on the string in the completely wrong place. It's pretty tightly wound. But I'll take it off and put it in the correct place after the bow is a bit better. I was able to draw to about 15 inches. At that point the draw weight was between 75 and 80 pounds. Notice the hinge in the upper limb. I'll need to thin out above and below that point too. Hinges are weaker points in the limbs. At those weaker points the bow bends more. The danger is that too much bending at one point can cause the bow to break. Friday I'd hoped to do several visits. Sometimes I mix in some home visits while I do the runs for shut-ins. Friday I had two good visits that took most of the day and several phone calls. Ernest and Cora went home fromt the Hospital. Ragna's still there. Keep them in your prayers, please. Saturday morning the fog was thick. 100 yard visibility. The hoar frost was on everything, even my car was disguised. The ice was too slick on the driveway to park the car in the garage last night. The fog disappeared during services at Mt. Olive. After Confirmation class I took a quick photo of Mt. Olive with what was left of the hoar frost on the trees in the background. Mt. Olive is small. But it is a steady and dedicated congregation that is growing. 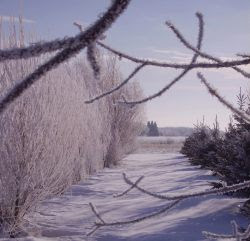 When I got back home I took a picture of Oak Park with the hoar frost on the trees. I know it's not so easy to appreciate on a small image like this, but the image captures a bit of the beauty. Mary went to TR today to write out some thank-yous. I spent the time with the kids. We watched Cirque du Soleil's "Dralion." I don't think it's as good as Alegria, but still a great show with the ability to mock itself. This evening I went over to have confirmation class with a couple of other students and their family. Home now. I got all the clocks set ahead. Even so, it's still psychologically difficult. I cant help but think that instead of 8am services tomorrow at St. Petri (32 miles away) my body will think it's 7am services. Kristi, thanks for the poem. You made me laugh. Wednesday morning Ragna's daughter called me to fill me in. She was suprised that I had already been in to see her mom. And Ragna hadn't remembered that I was there when she talked to Sheryl. Early afternoon, prepare for Wed. School, then Wed School, then Soup supper, then Worship, then Bible Study. Matt wrote up a script for an act he's hoping to do with the kids at camp this summer. He was so eager to show it to his friends. I made him wait until after Wed. School. We got home around 9:30. All in all, a fairly full day. Thursday the girls had piano lessons. I didn't go with this week. But Mary told me later that the drifing on the road was pretty hard to drive through. Dad went home today. It was great to have him here. And, Dad, thank you so much for all the help. I'll try to finish up the table before Palm Sunday. And about the table saw, it's not the saw, it's the breaker in the outlet that's shot. I'll have to get that replaced. The freezers are on the same circuit. I went to TR this afternoon to check on my hospital people and do some shut-in calls. Ragna looked somewhat stronger. Sheryl was there. They are doing some more tests to see what's going on. Ernest was in Therapy getting fit for going home. We'll see when it happens. Cora was fine. Mavis was doing pretty well. She has her ups and downs. Mabel seemed to be in very good spirits and doing well. Annie was good and fairly responsive today. I grabbed a bag of carne seca and went to St. Petri for worship and Bible Study; got home at around 9:30pm. Darrow and Shirley took Matt, Louisa, and Elsie to a wrestling match this evening. They got home just before I did. They seemed to really enjoy it. Each one for different reasons, of course. Louisa found a friend who likes to talk just as much as she does. Ummm, I think that's a good thing. One of Louisa's presents was a bunch of Bobbie Pins. She set to work Monday night on Sophie and herself. So, we have the "before" photo on Monday evening. Bobbie pins in the hair, hair all wrapped around them like cocoons around caterpillars. 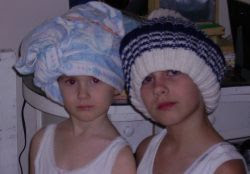 Heads in blankets and stocking caps to protect the carefully wrapped hair. Am I glad I cut mine short. I'd hate to have to do this kind of thing for myself. And, come to think of it, members of my congregations probably look at me sideways if I did. Here's what crawled out of the cocoons! Not bad for a first attempt! By the way, see the door knob behind Louisa. It has one of those child-protective covers on it. They work real good until the kids are either 1) tall enough to reach the door knob, or 2) clever enough to push a chair over to the door so they can reach the door knob. So why have it on the door knob? Good question! But I'm not a Zen Buddhist, so I cannot contemplate such a koan for long. It is similar to the question, "Why do hot dogs come in packages of 10, while hot dog buns come in packages of 12?" It's just the way it is, deal with it. So, Tuesday I went to do visits. Ruby is doing well. Evelyn is pretty good, though she's recovering from a fall she had a couple of weeks ago. She's a bit sore in her left shoulder. I stopped by to see Ragna at her apartment, but she wasn't there. I went to the hospital and found Ernest is doing a bit better, but he may need to be in the Hospital for some time yet for his leg to heal. Cora is uncomfortable with the idea of being in the nursing home. She is brought to visit Ernest a couple of times each day, but sometimes she doesn't remember the visits. While I was there today I discovered that Ragna is in the Hospital and not doing very well. I checked in on her. She was very weak and couldn't talk much. Please keep all our shut-ins in your prayers. I got home, ate, went to Church at Mt. Olive and held Bible Study afterwards. Sunday and Monday: Happy Birthday Louisa! Sunday, Church at St. Petri, then at Oak Park, then at Nazareth. Tami and family are away at Baltimore, MD for David's therapy. His Caring Bridge website is here. So, while David and family are in therapy and making good progress, we've been without an organist at St. Petri. But we do allright. We sing "acapulco" (acapella) and everyone does well. This afternoon we did some house cleaning--John and Stella are the chief engines of entropy in that regard. I did sermon writing for mid-week lenten services. Monday was Louisa's 11th Birthday. Dad came up today to help celebrate and to help with some projects around the house in preparation for Jeremy's Confirmation this coming Palm Sunday. 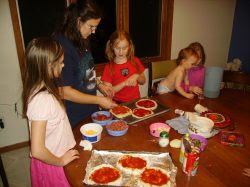 We all made our own personal pan Gluten-free pizzas for supper. Louisa and Elsie donned some pointy birthday hats for the celebration. Louisa did manage to get all her candles out on the first puff. And I had to reign in Matt and Jeremy when they started singing "you live in a zoo, you look like a monkey...."
After supper Louisa surrounded herself with the debris of gift opening-eagerly helped by her sisters and brother, John. Jeremy and Matt aren't too keen on opening "girl presents" now. Well, another year, and we thank God that He has allowed us to have Louisa with us. Friday was still wintery stormy through the morning. I spent quite a bit of time over in the office in the morning working on Thora's funeral sermon and the bulletin for her funeral. After noon Mary and I drove the boys to their piano lessons. Alyssa came to church and did the bulletin for Church and copied Thora's bulletin, Thank you. During piano lessons Mary, Sophie, John, Clara, Stella and I went to the Red Lake Falls Library. My first time there. It's a nice little library. I picked up the pilot for the 1978 Battle Star Galactica and for Babylon 5. After supper I went over to do more work on the sermon and Hymn planning. Saturday, What a nice morning. Clear sky, crisp fresh snow, low wind. We had Church at Mt. Olive and confirmation class. Then home to get ready for the funeral. 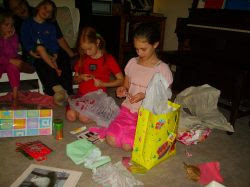 Thora's funeral was at 2pm, the committal at Clearwater Cemetary. Thora's sister flew in from California. It was good to meet her and the other members of the family. My kids sang from "Jerusalem My Happy Home" for the funeral. They did a nice job. I kind of crashed a bit after the funeral. and a gal who looked like she had the leaning tower of Pizza carved onto her head. I think I can remember who were the good guys and who the bad. Perhaps I should chalk it up as a loss. Late supper tonight. I did some more hymn selection work tonight, I'll go grab a bite to eat and come back to finish up. We've had a bit of snow over the past week. I said that I'd put a couple of kid pictures up on the blog. Here we have Elsie from last Sunday. Around noon, when the wind had subsided a bit, the girls went out. I went out to call them in for a late dinner (noon meal- actually around 1:30pm that day). 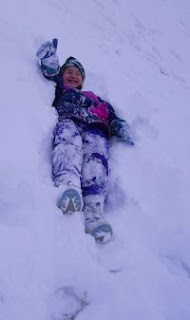 Elsie fell backward into the snow and thought she couldn't get up. The snow was too light for her to stand on top of it and to deep for her to walk in it. I convinced her to get out by rolling over on top of the snow. Inside I took my bow out to figure out the next steps and Stella wanted to help. She has a rasp in her hand and was pretending to work on the bow. The bow pulls about 75 pounds at its brace point. That means when the bow is strung it starts at 75 pounds and goes up from there. I'll have to do some more trimming to get it down to where I can use it. There was another storm today. It let up just enough to allow about 70 people to make it to Verner's funeral. For readers who's funeral traditions may be different I'll offer an explanation of what we do up here. First, there are several different things that happen when a member of our parish passes away. Sometimes the pastor is called to the death bed just before the person dies. Other times he is called to the family when the person has died. If he has been called there pastor holds a devotion with the family there at the deathbed. Then the family usually consults with a business that specializes in funerals and burial: This is usually a funeral home or the a mortician. The family and the pastor of the deceased meet to do some basic planning for the family and congregational worship services. At that meeting the pastor works to arrange when the services will be, who will be performing music, what that music will be, and whether there will be a meal at the Church. Sometimes the pastor is also involved in helping write the obituary if he knew the member well enough to contribute. We are fortunate to have funeral homes and morticians in this area who show a great deal of respect for Confessional Lutheran Congregations, our teachings, and our traditions. Very often there is a visitation scheduled for the evening prior to the funeral. The visitation is for the family and friends of the deceased. 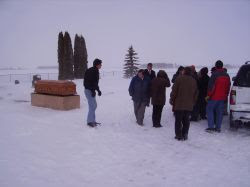 Very often the coffin of the deceased is left open so people can see him and pay their last respects. At the visitation the family may choose to have the pastor hold a special devotion with a short sermon. For example, last night I preached on I Thess. 4 and the comfort of the Resurrection. Often there is a time set aside for people to get up and share memories and stories they would like to tell about the deceased. 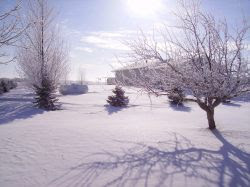 In my experience up here in Northern Minnesota the memories and stories tend to be about fun times and happy things the deceased said or did that impacted family and friends. Even during the informal time this is going on. The funeral is usually the day after the visitation, and very often our congregations provide a meal after the funeral. The morticians bring the deceased and any gifts of flowers and such to the church so that people may gather an hour before the funeral for a last viewing. Sometimes there will be special music before the funeral as the family and friends gather for the funeral. The funeral itself is not primarily for the family but for the congregation. It is a worship service in which we are taught from God's Word about the nature of sin and death, and the nature of salvation through faith in Jesus Christ, the resurrection of the body, and everlasting life. Music for the service must accurately teach the Word of God and be selected for its ability to reflect the theme of the Biblical text chosen for the funeral sermon. The text for Verner's funeral was John 11:20-27 with the theme "He will rise again." Usually, in our congregations, only some will want to go out to the burial, or "committal" service at the grave. Those who remain at the church building are invited to begin eating diner while the others are at the committal. The family chooses 6 men to carry the coffin from the church to the hearse. These are called "pall bearers." These men also go to the committal and carry the coffin from the hearse to the grave. 35 But someone will say, “How are the dead raised up? And with what body do they come?” 36 Foolish one, what you sow is not made alive unless it dies. 37 And what you sow, you do not sow that body that shall be, but mere grain—perhaps wheat or some other grain. 38 But God gives it a body as He pleases, and to each seed its own body. 55 “ O Death, where is your sting? Sometimes the family chooses to stay while their loved one is lowered into the grave and even through the burial. After the committal the family returns to the church for their dinner and conversation with friends and family, sharing memories of the past and plans for the future. This photo comes from just after the committal today. I asked the family if I could take and post this picture. Why? We were in the middle of a winter storm. 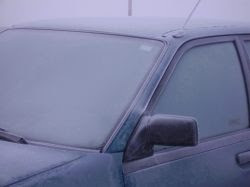 Given that there are people from all over the world that read this blog, I thought they might find it interesting to see what can happen here in the midst of winter. 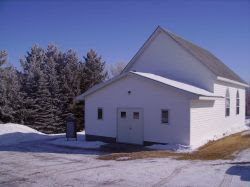 Here in Minnesota, as in many places in the U.S. and Canada many congregations have burial areas, cemeteries, where the dead are placed in boxes under ground. In the past winter prevented such burials because the ground was frozen. In many areas of the world and in some areas of the U.S. the ground is too rocky or to boggy for burial and so other things are done. Digging a grave in frozen ground is not an obstacle any more. But a snow storm can fill up a grave with snow as faster than it can be dug. The grave was dug last night and covered to prevent the snow from filling it. A steel vault was placed near the grave. The coffin was set on top of the vault for the committal service. The wind was too strong to allow us to set up a canvas awning as a shelter, so everyone stood in the lee of the hearse. After the committal service the coffin was lowered into the vault, the vault sealed, the grave uncovered and the vault lowered into the grave. The grave diggers then covered the grave with dirt. The purpose of the vault is twofold. First, it helps to preserve the body and coffin of the deceased for a longer time in case exhumation or relocation is necessary. And second, it keeps the ground in the cemetary from sinking in as the coffins decay. Graves are most often marked with stones inscribed with the names of those who are buried there, their birth-date and death-date. (There are some graves in our cemetaries that are marked with wood markers that need to be replaced every couple of decades.) Sometimes families will chose to have a special epitaph or picture inscribed on the stone. The stones can be tall and wide or short. They can be like small obelisks or they can be flat down level with the ground. Well, it's time for me to get ready to go to St. Petri for lenten service there. It's not snowing now. The wind is still blowing. But I don't think the weather will be a problem tonight.